Our range of products include hydraulic test bench, bernoullis theorem apparatus, impact of jet vanes equipment, losses due friction machine, hydraulic bench and flow over notches. Owing to the raw materials used in its manufacturing, the offered Hydraulic Bench is considered to be one of the best that is available in the market. Made available to the clients at a very reasonable price, this product, of unmatched quality, is highly praised. 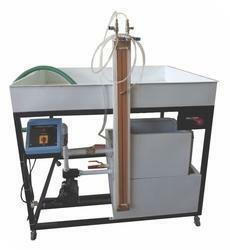 In addition, the bench provides highly efficient and effective results in fluid mechanics experiments. The present set-up is a self-contained, water re-circulating unit provided with a top tray and a sump tank. Various hydraulics experiments can be conducted on this set-up. A FHP Centrifugal Pump is fitted for water circulation. Flow control valve and by-pass valve are fitted in water line to conduct the experiment on different flow rates. Flow rate of water is measured with the help of measuring tank and stop watch. Water collected on the top tray from experimental set-up, drains and return to sump tank. 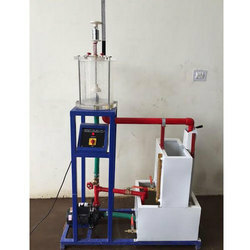 Our organization is counted among the listed manufacturers, wholesalers and exporters of premium quality Bernoulli’s Theorem Apparatus. 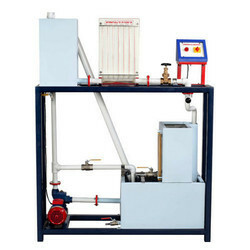 Offered apparatus is precisely manufactured under strict supervision in compliance with industry laid parameters. These units consist of a rectangular transparent flow section through which water is to be flown. The velocity of water changes across the sectional area of channel changes. Stainless Steel enclosure Having of opposite sides made of glass. We are counted among the most prominent manufacturers, traders and exporters of high quality Impact of Jet Vanes. Designed in compliance with industry leading parameters, it is used to study the forced developed of a jet of water on different surfaces and to compare it with momentum theory. Offered set up consists of visible test enclosure, supply tank, measuring tank and pump for closed loop water circulation. The setup consists of a two sided clear fabrication section. Water is fed through a nozzle and discharged vertically to strike a target carried on a stem which extends through the cover. A weight carrier is mounted on the upper end of the stem. The dead weight of the moving parts is counter balanced by a compression spring. The vertical force exerted on the target plate is measured by adding the weights supplied to the weight pan until the mark on the weight pan corresponds with the level gauge. A total of two targets are provided, a flat plate and a hemispherical cup. Sump Tank Capacity 50 liters. 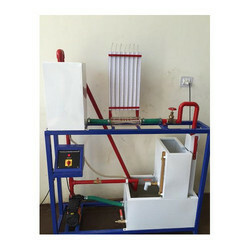 We are offering a wide range of Losses Due Friction Machine to our clients. Sump Tank Capacity (l) Capacity100Ltrs. Flow Measurement (l) Using Measuring Tank, Capacity 40Ltrs. 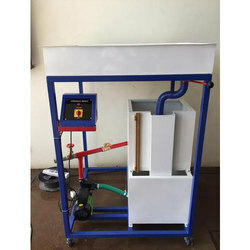 Water Circulation 1 HP Pump, Crompton/Kirlo skar make. The present set-up is a self-contained ,water re-circulating unit provided with a top tray and a sump tank. Various hydraulics experiments can be conducted on this set up. AFHP Centrifugal Pump is fitted for water circulation. Flow control valve and by-pass valve are fitted in water line to conduct the experiment on different flow rates. Flow rate of water is measured with the help of measuring tank and stopwatch. Water collected on the top tray from experimental set-up ,drains and return to sump tank. In order to provide maximum satisfaction to our clients, we manufacture this Bernoulli's Theorem Apparatus usingmodern technology and high-grade raw materials. Widely used for the purpose of demonstrating the Bernoulli's theorem, the efficiency of the offered product is impeccable. Offered to clients at the most reasonable price, it is highly asked for in the market. The equipment is designed and fabricated to demonstrate the Bernoulli's theorem. It consists of a test section made of acrylic. It has convergent and divergent sections. Pressure tapings are provided at different locations in convergent and divergent section. 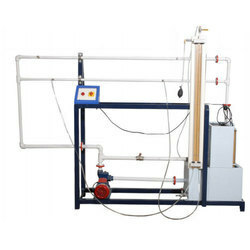 The set-up can be connected to Hydraulic Bench with flexible pipe line. Looking for “Hydraulic Bench Equipment”?